Dolly Parton’s Imagination Library is a program designed to get books in the hands of kids and their families, and to foster the love of reading and books. 1. A parent or guardian needs to register their child online or a drop off site. 2. Next, the child will receive 1 free book in the mail every month from the time they sign up until their 5th birthday. It takes 8-12 weeks for the first book to arrive. The first book is The Little Engine That Could by Watty Piper (Dolly Parton’s favorite), and the rest are tailored to the child’s age. For example, babies receive hard bound board books and 4 ½ year olds will receive paperback books. Each book is chosen by educational and literacy experts. Dolly Parton’s Imagination Library (DPIL) has partnered with American Printing House for the Blind, Inc. (APH) to make many of the wonderful books in her program, available in braille and audio format so that young blind and visually impaired children can also benefit from these wonderful children’s books. The books mailed to each child are chosen by a panel of children's books experts, with themes and concepts appropriate to each age group. Take a look at Themes and Concepts shared in the Imagination Library program, and the Book Committee. Take a look at the Blue Ribbon Selections of books mailed from Dolly Parton’s Imagination Library. Dolly Parton’s Imagination Library is the flagship program of The Dollywood Foundation. The Dollywood Foundation was created in 1988 by Dolly Parton to inspire the children in her home county to achieve educational success. Initial efforts focused on decreasing the dropout rate in the county’s high school. In the early 1990’s, Dolly promised every 7th-grade and 8th-grade student $500 if they successfully graduated from high school. This effort, called the Buddy Program, reduced the dropout rate for these two classes from 35% to 6%. More importantly, the program catalyzed the community to provide additional resources to sustain this improvement in the dropout rate. In 1995, the Foundation implemented Dolly Parton’s Imagination Library in Sevier County, Tennessee. This monthly book gifting program for children under five focused on inspiring a love of books and reading for all preschool children in the county. 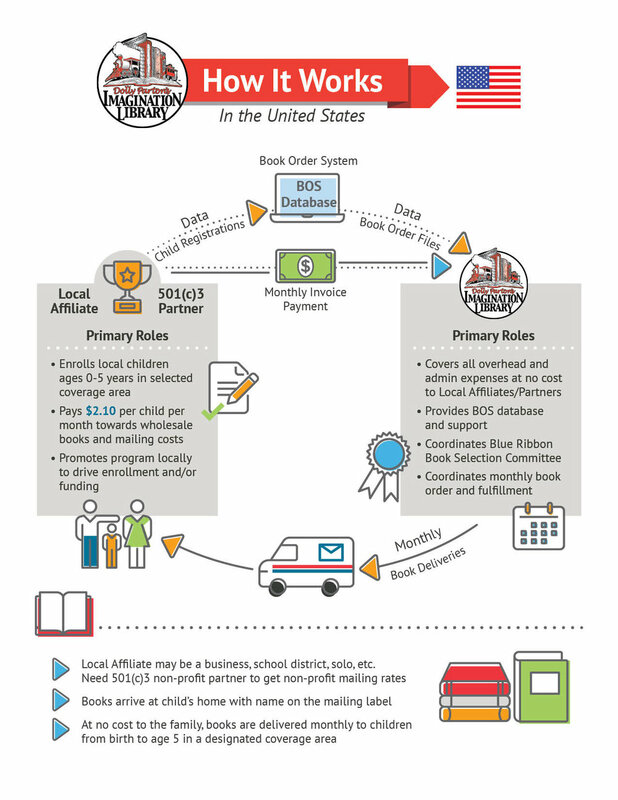 What was founded as a local program grew into an international movement through the unique partnership among the Foundation, the publisher, the fulfillment centers and the thousands of local organizations who adopted the program. The Imagination Library continues to be the signature program of the Foundation. The program became such a success that in 2000 a national replication effort was underway. By 2003, Dolly Parton’s Imagination Library had mailed one million books.